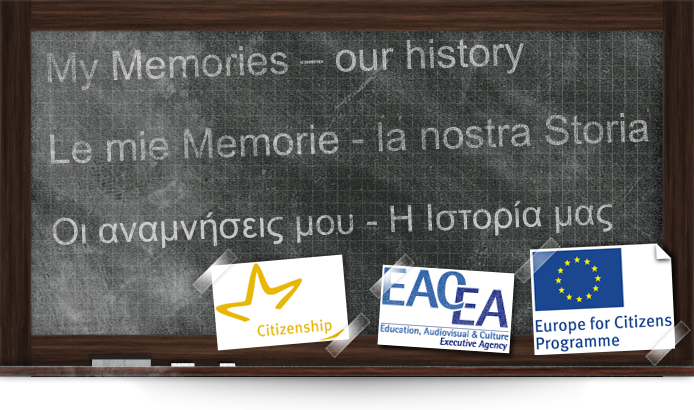 “My Memories – our history” aims at creating an educational path for educators and students to drive them into the discovery of the importance of keeping alive the memory on Nazism/Fascism in Greece and in Italy. In this section The Interviews collected in 8 Italian and Greek Schools are gathered. This activity has given the possibility in each country to make involved teachers in the training of the classes by an useful educative Toolkit and the students in the collection of oral contents by the direct meeting with The Interviewed people. Το πρόγραμμα “Οι αναμνήσεις μου - Η Ιστορία μας» επιδιώκει να δημιουργήσει μια εκπαιδευτική διαδρομή που θα οδηγήσει εκπαιδευτικούς και μαθητές στην ανακάλυψη της σημασίας της διατήρησης της μνήμης του Ναζισμού και του Φασισμού στην Ελλάδα και στην Ιταλία. Στην ενότητα αυτή παρουσιάζονται οι Αφηγήσεις που συγκεντρώθηκαν από 8 ελληνικά και ιταλικά σχολεία. Η δραστηριότητα αυτή έδωσε την ευκαιρία, και στις δύο χώρες, στους εκπαιδευτικούς να χρησιμοποιήσουν ένα χρήσιμο και πρωτότυπο Εκπαιδευτικό Πακέτο, αλλά και στους μαθητές να συμμετέχουν ενεργά στην καταγραφή προφορικών μαρτυριών από τους Αφηγητές. Το πρόγραμμα αυτό πραγματοποιήθηκε με τη στήριξη του Europe for Citizens Programme της Ευρωπαϊκής Ένωσης. Il progetto "Le mie Memorie - la nostra Storia" mira a creare un percorso educativo per istruttori e studenti volto alla scoperta dell'importanza di mantenere viva la memoria sul Nazismo e sul Fascismo in Grecia e in Italia. In questa sezione sono raccolte Le Interviste realizzate da 8 Scuole italiane e greche. L'attività ha visto protagonisti in ciascun paese sia gli insegnanti, nella formazione delle classi attraverso l'ausilio di un utile Toolkit educativo, che gli studenti, nella raccolta dei contenuti orali attraverso l'incontro diretto con Gli Intervistati. 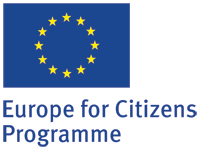 The toolkit or "educative package", including video and pfd documents, is an useful tool to help the teachers and the students in approaching the life history becoming active heroes in the collection of the oral memories. Il toolkit o "pacchetto educativo", che si compone di video e documenti in pdf, è un utile strumento per aiutare gli insegnanti e gli studenti ad avvicinarsi alla storia orale diventando protagonisti attivi del recupero della memoria.